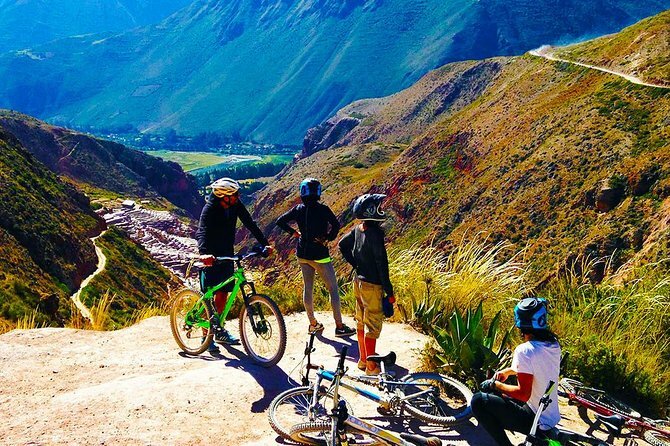 The best way to explore the sacred valley is going by bike enjoying the sceneries around Maras town visiting Moray and Salt Mines riding in a nice Trail. We start our tours In Ollantaytambo or we can go to pick you up from your hotel around de Sacred Valley previous request with no cost, (Except from Pisaq Valley Or Cusco). The guide will be waiting for you with the driver who will join you for the whole tour. All of the necessary equipment and the bikes loaded up in the car we will head the adventure towards Moray where we will visit the archaeological site before we start biking. This route has beautiful views of mountains and glaciers that surround it. The guide will stop at certain points so that you can rest and take awesome pictures. We will reach the pre-colonial village of Maras continuing biking to the salt mines, a beautiful pre-inca architecture wonder, here you will see local people producing salt for local and international consumption. We start from Ollantaytambo, where the guide awaits ready with all necessary equipment and bikes and the transportation. We will leave Ollantaytambo and go towards Moray, where the bike ride will begin. Previously we will visit the archaeological site of Moray. Moray is one of the very important archaeological centers located in the Sacred Valley. This place was a research center, where for many years the Incas studied the different types of seeds that they would use in the valleys of culture. After visiting Moray, the guide will provide you all the safety equipment and bikes and will give you a small introduction and presentation of the route where we are to ride the bikes and have fun! This route has beautiful views of the mountains and glaciers that surround the area. The guide stops at strategic points where you can take the best pictures of the scenery including the pre-colonial village of Maras. In Maras we rest before we continue and eat some snacks that the guide will provide you. Continuing the tour we will stop at the Salt Mine, where we enter to visit the place. The Salt Mine is pre-Incan. You can appreciate the architecture of the building, where local people work to produce salt for local and national consumption, although today some production is being exported to different parts of the world. After visiting the Salt Mine take again the bikes and go down in the last part of the route to Tarabamba where our driver will be waiting for us. We load the bikes and return back to Ollantaytambo.